Politics is a great way to see communications done well. It also is a means to see how a few mishaps can be extremely detrimental for a candidate, industry and a nation. On that note, I really enjoyed reading David Axelrod’s new book entitled Believer: My Forty Years in Politics. Disclaimer: I actually am not a big fan of many of the politicians whom Axelrod represents. However, from afar, I’ve always found Axelrod to be a very talented strategic communicator. Regardless of what you think of Barack Obama, few could argue that his campaign in 2008 was absolutely genius. And the mastermind behind it was Axelrod. There were numerous insights from Axelrod’s book that can apply to other communicators, regardless of their industry. Here are just a few. 1. 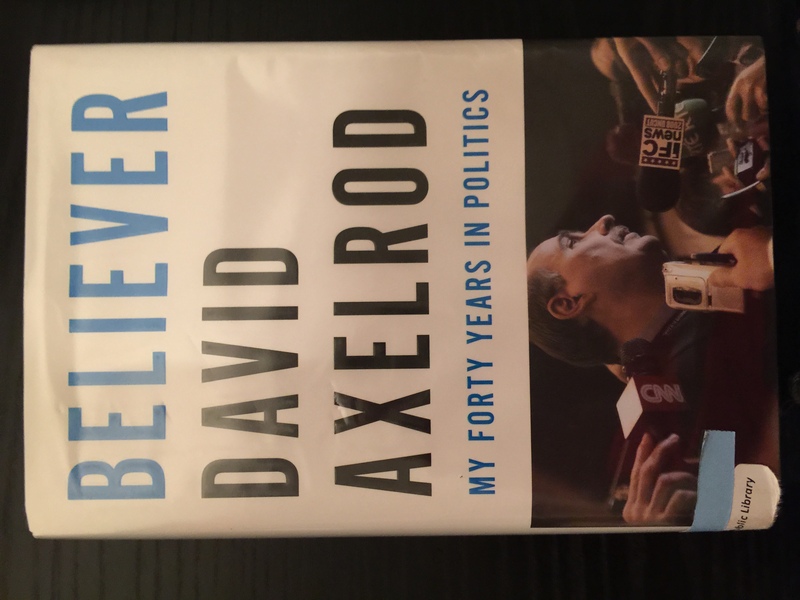 Axelrod describes how he met with Illinois gubernatorial candidate Rod Blagojevich in 2002 to explore a working relationship. Axelrod asked Blagojevich why he wanted to be governor. The answer from the gubernatorial candidate: “You can help me figure that out.” Axelrod told him “if you can’t tell me why you’re running, I can’t help you explain it to others.” (Side note: Axelrod didn’t work with Blagojevich, who went on to win, only to be impeached in 2009 for corruption. He is currently serving a 14-year prison sentence). 2. Axelrod was behind the election of Chicago mayor Harold Washington in 1983. Washington, who died while in office, was African American and won the election in which there were racial sensitivities and dynamics. From Axelrod’s point of view, it was important that Washington was celebrated as the mayor of all Chicagoans, not just those from certain ethnic groups. To that extent, Axelrod and his team wanted to present a diverse picture for television camera crews and newspaper photographers at the victory celebration. Two large – and rather divisive personalities – were on hand for the celebration: Jesse Jackson and Don King. Axelrod and his team didn’t want these two to be sharing the center stage with Washington. The felt it would send the wrong message. So they tried distracting the two with other media responsibilities that would coincide with the timing of the victory celebration and take them away from the limelight. But sure enough, when the time came, Washington was flanked by King and Jackson front and center. The two found there way to the cameras. It was not the message the campaign wanted to send. Implications for communicators: Sometimes it is best ruffling a few feathers, even if they are sensitive feathers, for the sake of ensuring a consistent and strategic messaging. Surely there could have been a way to diplomatically communicate to King and Jackson what the PR goals were for the victory celebration and what their role should be. 3. Axelrod described his time working with the John Edwards campaign in 2004. It didn’t work out very well for Axelrod. In retrospect, Axelrod described his initial encounters with Edwards and how it didn’t naturally feel right to him at the outset, but he went ahead any way. Implications for communicators: It might sound like a worn out expression, but ‘trust your gut’. I am sure we all have taken on a job or assignment that didn’t feel right, but we went ahead anyway with it for various reasons. Usually these scenarios backfire. For something as personal as our communications, we need to buy-in and connect with the message and messenger. 4. It is the 2008 Democratic primary, and following Obama’s upset victory over Hillary Clinton in Iowa, the scene shifts to New Hampshire. In the lead up to the election, Hillary Clinton has a heart-to-heart talk with voters in which she goes on the cry as she passionately discusses her motivations to be president. Axelrod noted that Edmund Muskie ran for President in 1972 and pretty much did himself in when he cried during a public talk. But this is 2008 and Clinton’s vulnerability actually made her more likeable in the minds of New Hampshire voters. She went on to beat Obama in New Hampshire. Implications for communicators: This is a nice little case study that demonstrates how transparency can go a long way to resonating with the individuals we are communicating to. 5. Axelrod details two instances when individuals got themselves into trouble when thinking they were speaking to private gatherings. Barack Obama is on what he thinks is a closed conference call with donors in 2008 when he talks about “Americans clinging to their guns and religion.” The remark goes public and the opponents blast this sound bite consistently for months. Four years later, Mitt Romney gets himself into similar trouble when he tells a group of donors about the 47% of voters who don’t pay income taxes and feel entitled to government support. That remark went viral and put the Romney campaign on its heels for alienating a large percentage of the electorate. Implications for communicators: There are no such things as closed-door meetings. We should assume everything is public, regardless of whether we “officially” allow media into our event. Everyone is essentially a journalist with their mobile devices, equipped with cameras, audio recorders and mobile live streaming apps. 6. It’s Christmas day 2009 and Umar Farouk Abdulmutallab is en route to the United States from Amsterdam when he tries to blow up the plane. It is a crisis scenario. The next day, the Obama administration sends out Secretary for the Department of Homeland Security Janet Napolitano to speak to the Sunday morning talks shows. Axelrod reflected on this tactical mistake. It should have been Obama in this case. Implications for communicators: In the midst of a crisis, we want to hear directly from the top. There were numerous other tips like this from the book. This is among the reasons I suggest you give it a read. Here is more information.